Ok, so what’s the worst thing about trying to eat healthy and never gain an ounce of fat? I can easily pass up junk foods, like fast food, even French fries; certainly donuts and greasy pastries I long ago lost a taste for. One of the biggest challenges, in my humble opinion, is finding the healthy snack foods like the kale chips above, that can take the place of potato chips when you’ve gotta have something crisp and at least a little bit salty! I confess that occasionally, I have to indulge in something crunchy and yes, salty, to go with my green smoothie or mix with some raw nuts for some crunch along with the protein. I’m happy to say that the store bought, healthy snack food situation is improving. The industrial food companies have finally gotten the message and are trying to make more tasty snack foods without transfats, sugars, and high glycemic additives like maltodextrins and too much salt. 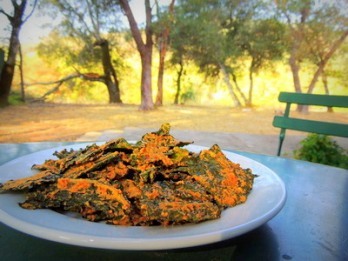 Kale chips are a top choice because they are baked and well, they are made with the healthiest vegetable on the planet. However, they do, ahem, have to be made by you! That takes a little time. What can you buy? Here are some suggestions I made to a recent visitor who asked a question about a snack to take the place of potato chips. Potato chips are hard to beat but I found two chips you can buy that are close enough to being as satisfying as a Lays potato chip. A new brand of chips I found at my super market are called Plentils that are made with lentils and are plenty tasty. They do contain potato starch which is a high glycemic starch. However, because the lentil powder is high protein and low glycemic, I don’t think they’ll raise your blood sugar unless you go nuts with them. The test for me is do they create cravings and they do not for me. And they are filling so I would say they have a high satiety index which is a plus. Another healthy store bought snack food I am crazy about is called Beanitos. They are made with beans and rice with minimal processing, use sea salt and are light on the sodium and high in fiber. There are several varieties using black beans, white beans, pinto beans, chedder cheese and even black beans, chipotle! You can eat them with guacamole and salsa and a salad and you've got lunch. Or try them with your afternoon snack with a glass of almond milk and a piece of fresh fruit. This may be the best chip you can buy when you want to lose fat or maintain your ideal weight. Have you visited Lifetime Fat Loss lately? If you have any questions about what you read on Lifetime Fat Loss, ask me here in Your Questions.